UNITED NATIONS, December 2 -- Pushing for new UN Security Council sanctions on Eritrea, the US and Gabon wanted a vote on November 30. After running into opposition, it was decided that Eritrean President Isaias Afwerki would to invited to address the Council on the morning of December 5, along with representatives of neighboring countries, then the vote would occur that afternoon. 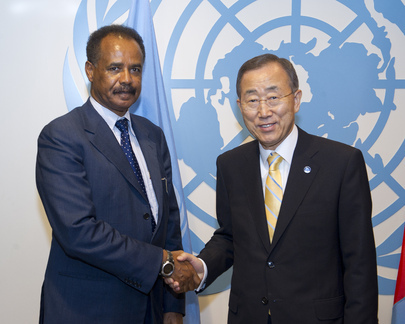 Eritrea responded that the turn-around time was too short, and asked for an extension. Inner City Press on December 2 asked US Deputy Permanent Representative Rosemary DiCarlo about Eritrea's request for an extension. "The schedule is Monday," she told Inner City Press with a smile. "See you Monday." When December's Security Council president Russia's Permanent Representative Vitaly Churkin gave a press conference, Inner City Press asked him about Eritrea's request, as well as for Russia's view of the proposed sanctions, which refer to the mining sector and remittences to Eritrea from its diaspora. Video here, from Minute 18:45. Churkin described the schedule for Monday, then said he thought the President was coming, that "visas have been issued," but that if he could not Eritrea could be represented by its foreign minister or Permanent Representative Desta. Churkin said Russia and others still have some concerns with the proposed sanctions, which are still being negotiated. South Africa's on the record comments to Inner City Press on the sanctions are online, here. On December 1, a self-described "senior Western diplomat" said of the proposed new sanctions on Eritrea, "It is the tightening of the screw...to deal with their taxes on diaspora income. They elicit taxes through their embassies from the diaspora. It's a kind of extortion." Some have pointed out, for example, that Nordic and other countries tax the income of their citizens working overseas. The question of how taxes are collected is an important one, but as some Council members complained to Inner City Presss when the US and Gabon pushed for a November 30 vote, there's been no briefing on the issue from the UN Secretariat, to get the facts. Now the vote is scheduled for December 5, but there has still been no such briefing. While one hopes that the President of Eritrea comes, if only as a matter of due process, as one Council member mused to Inner City Press, "to put a head of state into a situation in which he speaks to the Council in the morning, and they adopt sanctions against his country in the afternoon, is a set-up for a no-show." Another suggested that the Council should have scheduled the President to speak as early in December as he could, and then hold the vote on another subsequent day. But for now, the showdown is set for December 5. Watch this site.